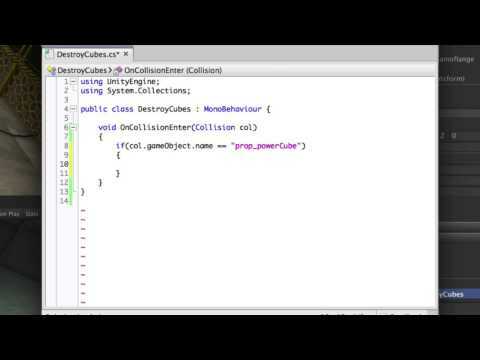 How to detect collisions between objects in code using the OnCollisionEnter function. that has been collided with. The script attached to the ball looks like this. Currently we have nothing inside the function. check for when it has hit a power cube. when our ball collides with our power cube. variable and then typing a dot (period) in the script editor. different data you can retrieve from the collision. class to see other data that you can retrieve. For now we'll simply destroy the game object. our ball destroys a power cube.